Cafés became very popular in the thousand years anniversary in 1896, as Budapest organized a World Exhibition behind the Heroes Square. Budapest had over 100 cafés at that time! Cafés were originally made for serving only coffee. The first cafes opened in 1550s in Istanbul. Only men were allowed to visit them. Women were allowed to visit them only in the 20th century. Cafes multiplied in the second half of the 19th century. It became a meeting place for friends. At this time television has not been invented, so people came here for news. They could read the newspaper there peacefully, or they could get informed by other people. People talked about politics, and many famous people could be seen in cafes. This beautiful worldfamous Baroque building was built in 1894 and it was renovated lately. 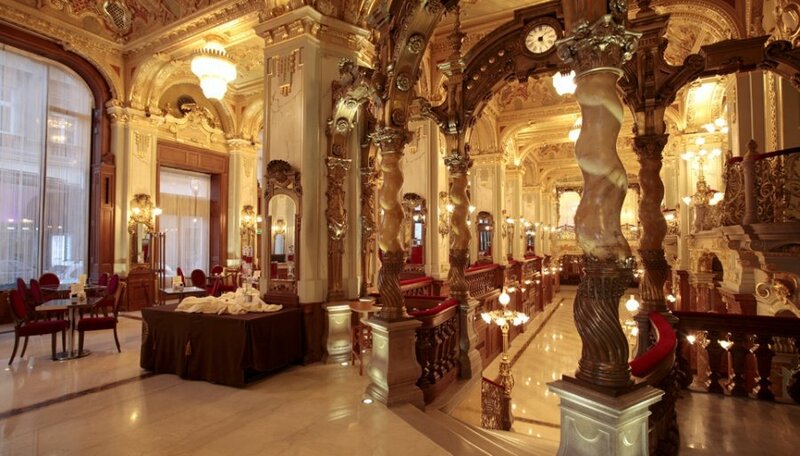 Today the Café New York is one of the most beautiful Cafés in the world! It history started with Max Aufrichttel who travelled to Paris, where he met the director of New York insurance company. Max got the task of forming a Hungarian network, as the company had one representative building in each important European city. It became the centre of literature in the 90s of the 19th century as the Harsányi brothers became the managers. They introduced „the bowl of literature”, which contained little ham, sausage and cheese could be bought on credit only by writers and poets.They stored large amount of ink and writing set in the storage. Many famous Hungarian poets and writers passed their freetime here. This confectionery was founded in 1858 by Kugler Henrik. It became worldwide famous under the next owner: Emil Gerbeaud in the 90s of the 19th century. The sour cherry with Cognac and the „cat tongue” was nationalized by him. He also made coffee specialites. There is a cake called Gerbeaud with wallnut and apricot jam and chocholate cream on the top. Apricot jam is the most famous fruit in Hungary, we produce from that the world famous apricot brandy of course. This cake is very important for the Christmas dinner beside „beigli cake” for many Hungarians. By the end of 19th century this café had 150 employees coming from different countries just to learn from Mr. Gerbeaud. There is a beerhouse also under the popular café. Mr. Gerbeaud had 5 daughters and the family left the country during the World War II., now they live in Switzerland. It can be found in the 5th district in Budapest. It was founded in 1838 by Privorsky Ferenc. It got its famous name from the next owner Mr. Károly Pillwax. He managed the cafe in the 40s of the 19th century. In the reform era the Café Pilvax was the meeting point of young intellectuals. It played a very important role in politics. One of the important guests was Mr. Sándor Petőfi, one of the most important Hungarian poets, later he became an important figure of the revolution. In 1848, on 15th March Petőfi recited his poem, the National Song (Nemzeti dal) in front of this cafe. From this date the cafe used the name Revolutionary Hall for more than one year. Today it waits the visitors under the name of Pilvax Restaurant and Hotel.